This summer while we were at the cabin together, Stewart and I had time to look at some of his older stories about the land in Alaska. He wrote these pieces about a dozen years ago, and they’ve never been published. I’m excited to share them here. Now let’s go back to the mid-1990s . . . The weather turned wet and blustery on the day we set out for the land. It was a long trek, more difficult than I’d remembered. When we finally reached the top of the ridge I stood gasping for breath under my heavy pack, peering into the valley below. We’d left the dirt road hours ago, and the climb had taken everything I had. We stopped under the shelter of a rocky outcrop to get out of the wind and pull some soggy pizza out of our pockets. I noticed Birch wasn’t issuing any complaints as we sat under the low hanging clouds and mist. He was the perfect person to have along on this daunting adventure, and I couldn’t even imagine it without him. Birch was a log cabin builder by profession, as well as an experienced woodsman and longtime Alaskan. I’d met him when I first moved into my cabin at Two Mile, and we’d become friends over the years. 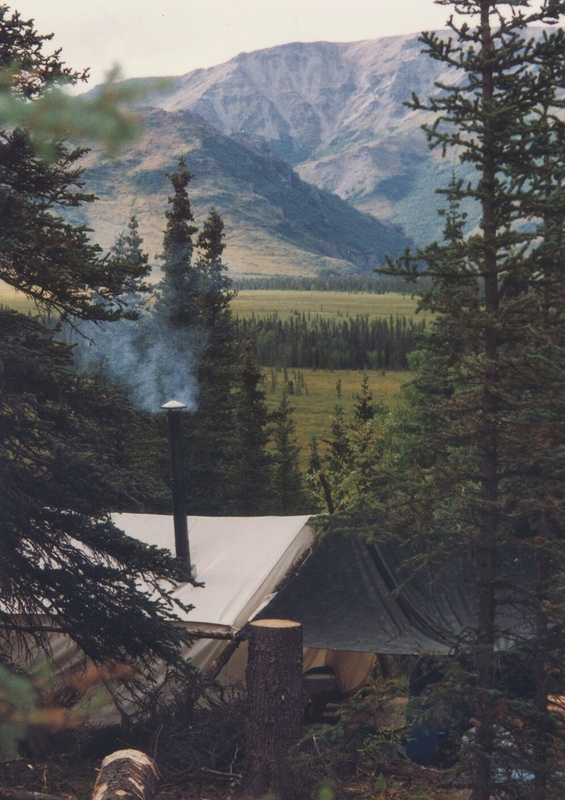 A poet and woodsman both, Birch personified the rugged individualism so characteristic of Alaska. He was once dropped by bush plane in the far northern reaches of the Brooks Range to build a cabin by himself before the fall of winter. He carved the rough log structure from the forest in a matter of weeks, while at the same time defending himself from local grizzlies that had become interested in his presence. Birch was a touchstone with the natural self I felt so estranged from in my far removed life “outside.” Each time a letter arrived in his familiar scrawl, I felt a pang of nostalgia as my connection revived. My plans for building in the foothills of the Alaska Range had seemed crazily ambitious as I sat on the tarmac at the Fairbanks airport. I felt overly citified and out of place in my California clothes among the rough wool shirts and heavy pants of the “real Alaskans” around me. What was I thinking? How would I survive for more than a month in this demanding country? We were brazenly embarking on a project that would span many years and hold challenges that I could only begin to guess at. Our first plan was to build the cache, a traditional log building high in the air on stilts where we could store our food and tools during the months we would be absent. Without a cache, any materials left on the ground would be ready fodder for bears, wolves and other denizens of the land. After building the cache, we could begin to cut trees in earnest for the construction of the cabin. We’d scheduled an airdrop for the day after our arrival. The supplies — a few tools and food enough for the month — were purchased in Fairbanks and packed in boxes that we’d hoped could survive the drop to the tundra. The plane landed on a nearby ridge in order to unhinge and leave behind its passenger door. Then the seasoned pilot took off with the wind raging through the open cockpit. He swooped low over the land at near stalling speed and pushed the supplies from the open side of the plane. The boxes tumbled end over end as we watched closely so as not to lose track of their precious contents. They bounced high in the spongy brush and sometimes broke open, spewing their contents over the acres of dwarf birch and bog blueberry. We made mental notes as apples, butter, bacon, rice, and tea scattered everywhere, hastening to bring everything in before it was lost to other hungry mouths. We kept tools to a minimum. A shovel came tumbling out of the door taped to a few pieces of wood for making a rough table to prepare food. Our canvas wall tent landed with a hard thud. We would cut spruce poles and get the heavy barrier up as soon as possible to grant us some shelter from the elements. Axes, bow saws with extra blades, and 12-inch spikes rained down from the heavens. Our new airtight woodstove landed with only a few dents. We scampered to pick up each implement that would be crucial to our work. We’d decided against using power tools. It would be grueling cutting down the trees using just single person bow saws, but I couldn’t bring myself to unleash the sound of a chainsaw in this ancient valley without history of human habitation. There was an archeological dig across the river that had proven to be the remains of a nomadic hunter-gatherer party from over 12,000 years ago. Those eons of silence weighed on me as I imagined the offensive whine of a gasoline engine where forever there had been only the sounds of the wind and water, and only recently the occasional hum of over-flying bush pilots. Continue to Part 2 . . .
I’m so impressed with Stewart’s writing…both of your writings. So glad for this story. What a wonderful start to what promises to be a great story. Can’t wait for part 2. I wanted to let you know this is where I came in to your story and I am thoroughly enjoying it. I went back to June and read everything. Love your writing style (and your husband’s) and I am so glad I found you. Looking forward to your future posts! I’ve added you to my must reads. Thanks so much!! Wow, Liz. Welcome! Thank you for joining in and catching up with all that reading, and for your very kind words.